May 25, 2014 – Elections to the European Parliament that will lead to a President of the EU. But what to do about a European Energy Policy at a time the Austrian OEMV wants to help Russia’s Gazprom build a pipeline to bypass The Ukraine and force Europe to be slaves to Gas for years to come? WE ALL KNOW THAT THE FOLLOWING IS TRUE BUT BY NOT VOTING AT ALL YOU DO NOT ACHIEVE A THING BEYOND ASSURING THAT DECISIONS WILL BE TAKEN WITHOUT ANY CONSIDERATION TO WHAT YOU HAVE IN MIND. IF YOU VOTE YOU MIGHT OPEN THE DOOR FOR WHAT YOU NEED. This is the eighth elections to the European Parliament – and perhaps the forst really important election as it will lead to the establishment of the FIRST PRESIDENT of the EU. There are many subjects of first line importance that will have to be decided by the new Parliament but some of the most important topics are not mentioned in the election campaigns – this because they might be too controversial for the constituencies. We will deal here just with one such topic – the need for an European energy policy that is not based on imports of gas.The insecurity of Russian supplies ought to teach Brussels that best energy policy is one of efficiency in the use of energy and supplies that are local and from Renewable Energy sources. If this lesson is not forthcoming in days of constraints applied who is full enough to believe in promisses that such policies will be made posible in a calmer future – if this ever comes? Russian gas supplies ‘not guaranteed’, EU commissioner warns. The EUobserver May 2, 2014. BRUSSELS – A first mediation attempt by the EU between Russia and Ukraine on their gas price dispute on Friday (2 May) in Warsaw ended with no results other than the willingness to meet again. 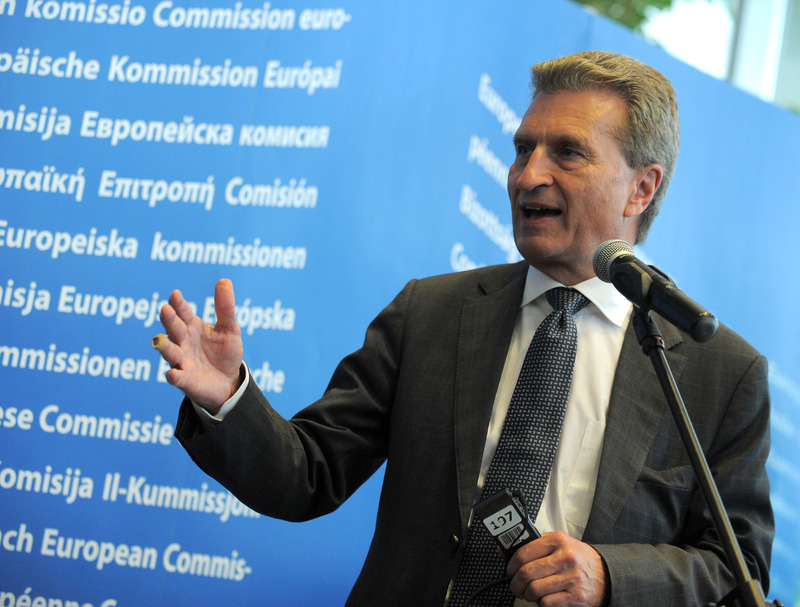 “It is with concern that we see the security of supply for end consumers in EU and non-EU states like Ukraine is not guaranteed,” EU energy commissioner Guenther Oettinger told press after the meeting. The energy ministers of Ukraine and Russia, for the first time at a table since the annexation of Crimea and the Russia-backed separatist movements in eastern Ukraine, decided to hold separate press points rather than join Oettinger in a common press conference. Still, when asked about the atmosphere in the meeting, Oettinger responded that “we are all adults” and emphasised the willingness of both sides to meet again mid-May. “The European Commission will stabilize Naftogaz [Ukraine’s state-owned gas company] and Ukraine and will be a fair mediator for justified and fair gas prices,” Oettinger said. At the core of the current dispute is how much Ukraine owes and has to pay for current and future gas deliveries from Russia: 485 US dollars per cubic meter of gas as Gazprom demands or roughly half of it, the price Kiev used to pay before the political turmoil that started late last year. For the Russian side, the price is “clear, set in the contract signed until 2019” and any negotiations are “odd”. Russian energy minister Alexander Novak told press after the meeting that Ukraine has not paid for any gas it imported in the last quarter of 2013 and the first three months of this year. “There is a 16 May deadline when an invoice will be issued to pay for the gas by 31 May and to prepay for the consumption in June. If by June these payments are not made, Gazprom will have the possibility to restrict supplies to Ukraine,” Novak said. He added that European supplies should not be affected as they are paid for until September 2014. Any disruptions in gas flows to the EU during this time should only be blamed on Ukraine, if it “illegally” taps these supplies or diverts them to storage. Novak also questioned plans by the EU to reverse the flow of gas and supply Ukraine with Russian gas via Slovakia. “If such contracts are executed, we’ll look at them very attentively and reserve our right to address courts and institutions of arbitration,” he said. As for Ukraine, its energy minister Yuriy Prodan said the doubling of the gas price by Russia was “discriminatory” and “abusive” and that Kiev will take the matter to the international court of arbitration in Stockholm. “It is possible that in arbitration we can change the volume of our debt to Gazprom, possibly no debt at all,” Prodan said. 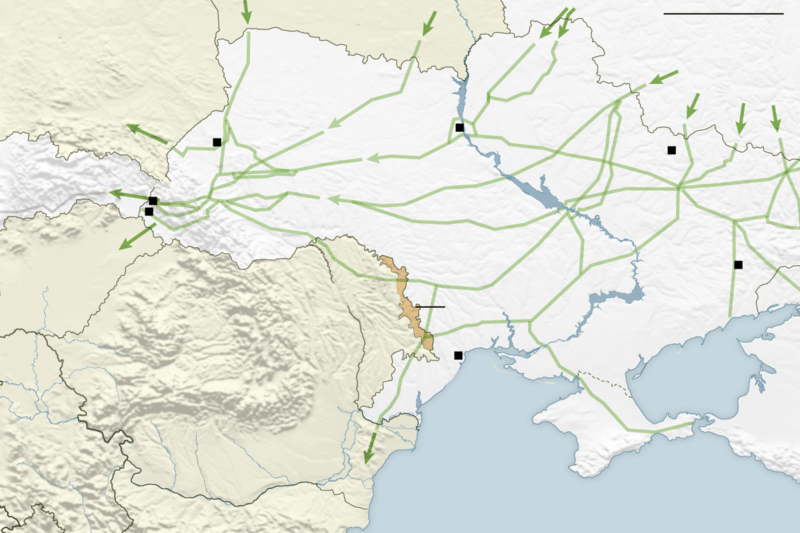 Ukraine is the main transit country for Russian gas supplies to EU countries, with previous price disputes having translated into gas cuts at the height of cold winters, leaving citizens in Bulgaria and Slovakia in the cold. The situation has since improved, with increased reserves and the capacity to reverse the gas flow from less-dependent EU countries to the ones totally relying on Russian imports. But with pro-Russian separatists shooting down two Ukrainian helicopters and with Russian President Vladimir Putin declaring a Geneva peace deal “no longer valid”, the chances of a solution to the gas dispute are low. 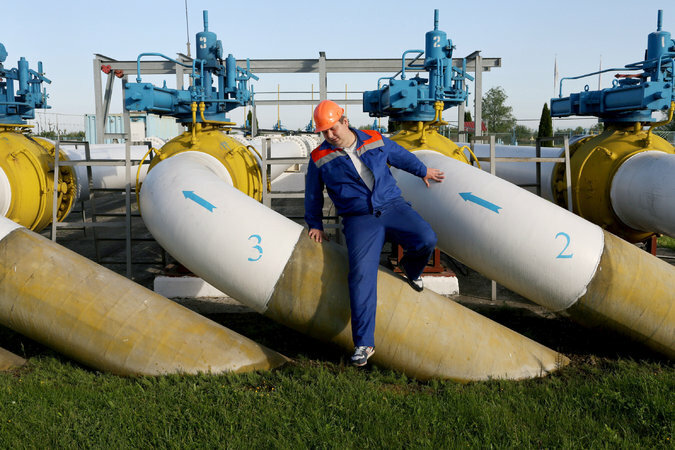 Related — Ukraine signs gas deal with Slovakia. Above is a fine description of the situation when all what Brussels is ready to talk about is the supply of new gas to old pipelines – “in reverse.” we find this ridiculous because we did not hear of any of the parties running in the elections for the European Parliament saying in full light that Energy Policy is not a synonim for Gas Policy. Where is the call for investment in a long term solution that makes the gas unneeded? YES, THEY CAN – AND IT IS POSSIBLE TO DO IT! In Austria we follow this topic closely by monitoring the position of the top people in the various parties – and even having picked up in private this topic with them – we found something that until today I used to call a Chicken’s attitude. “A PIPELINE SPLITS EUROPE” – it is the Austrian Oil Company OEMV that has a contract with the Russian GAZPROM to build the SOUTH STREAM PIPELINE to bring Russian Gas under the Black Sea to Bulgaria – and from there via Serbia, Hungary to a branch to Austria – that will link to Central Europe, and another branch to Slovenia – that will supply Italy and West Europe. The First leg is to follow the route: Bergowaja near Sochi in Russia – all the length of the Black Sea to Varna in Bulgaria -Pleven in Bulgaria – Subotica on the Serbian/Hungarian border – to Baumgarten in Lower Austria. The idea is to bypass the Ukraine, Moldova, and Romania. This is an answer the Russians think to apply to their relations with their pesky Ukrainian neighbors, and Austria is playing the European partner in this scheme. With OEMV having strong connections to the Austrian political system – voila – the reason the Austrian parties are not keen to do more then just speak with low voice about true ENERGY INDEPENDENCE. I find this very disturbing, and though I do not want to be the first to point fingers – suffice to say that this might undermine many good positions Austria has in its attempt to help solve in a logic way the Ukraine/Russian controversy – something that becomes impossible if the government ends up speaking for the National Oil Company. In 1989 the freeing of East Europe started with a picnic in Sopron Hungary. Why does the UN still recognize as one of its constituent regions the Eastern Bloc of Communist Countries? One more reason to target 2015 for a review of the functioning of the UN. as a commemoration of the famous Pan-European Picnic in August 1989 where citizens of Hungary, Austria and other countries met to demonstrate for the necessity to tear down the Iron Curtain and unite Europe in peace and freedom. On this occasion, several hundreds of GDR citizens managed to escape to the West, by literally tearing down the old wooden gate on the site of the Picnic. These events 23 years ago have been the first step for German and European re-unification. “The soil below the Brandenburg Gate is Hungarian soil.” (Helmut Kohl) could be described as motto of the historical happenings at those times. The role Hungary and Hungarians played by overcoming these obstacles should not be forgotten. Our aim is to make a tribute to these historical moments by hosting an international conference assembling experts, the former organisers and civil rights activists, in total some 250 attendees. Moreover, we expect 100 youngsters from over 30 European countries in order to ensure the sustainability of this endeavour. Please note that the overall conference will have simultaneous interpretation in three languages (English, German, Hungarian). In the attachment you will find a preliminary programme and a short fact box about the background of the Pan-European Picnic. May you have any further inquiries or questions, do not hesitate to contact my assistant, Dr. Bence Bauer via bence.bauer@kas.de or +36 20 3345199. Registrations are possible with the attached form until July 10. An ALBA with at least FREEDOM OF EXPRESSION PROBLEMS – Seventeen states suggested (Fundamedios/IFEX) that ECUADOR respect and guarantee freedoms of the press and of expression. (Fundamedios/IFEX) – 21 May 2012 – Seventeen states from the Americas, Europe and Asia suggested that the Ecuadorian government should respect and guarantee the freedoms of the press and of expression in the country. They made these observations on 21 May 2012 during a session of the UN Human Rights Council, where the states assessed Ecuador using the mechanism known as the Universal Periodic Review (UPR). Germany, Australia, Austria, Belgium, Canada, Costa Rica, Estonia, United States, Slovakia, Latvia, Luxemburg, Norway, France, India, Sweden, Switzerland and the United Kingdom were the countries that presented observations to the Ecuadorian State that it should promote and respect freedom of expression and eliminate laws that criminalize opinion. Some of them also requested that Ecuador should make possible a visit by the UN Special Rapporteur on Freedom of Expression to examine the situation of freedom of expression in the country. The European countries’ delegations were the most critical. Sweden, for example, mentioned the case that led to the conviction of a former feature writer and the directors of the newspaper El Universo; and although President Correa abandoned the lawsuit, it recommended that the Ecuadorian State should protect freedom of expression. Meanwhile, Switzerland emphasized that an atmosphere of censorship and self-censorship prevails in Ecuador and that the State has the obligation of respecting this fundamental right, while Luxembourg expressed concern for the intimidations against Ecuadorian journalists. Among countries in the Americas, the United States was one of the most critical, showing its concern for attacks against journalists and because in Ecuador freedom of expression is not fully guaranteed. Canada and Costa Rica also issued recommendations to establish measures that guarantee the protection of this fundamental right in accordance with international regulations. The criminalization of social protest and free association concerned Belgium, Canada, Estonia, France, Germany, Hungary, Latvia and Luxembourg, all of which recommended that guarantees should be in place to allow opposition groups and communities to protest freely, without being condemned as terrorists or saboteurs. In regard to this issue, Spain recommended reviewing the restrictive legislation against NGOs and the criminalization of social protest in the country. Faced by these pronouncements, the Ecuadorian delegation, led by Vice-president Lenin Moreno; the Minister of Foreign Affairs Ricardo Patiño; the Minister of Justice Johana Pesántez and the National Communication Secretary Fernando Alvarado affirmed that the press is neither censored nor persecuted in the country and that there are no jailed journalists in Ecuador. “Freedom of expression is absolutely and wholly respected in Ecuador”, stated Minister Patiño. The 17 observations exceed in number those issued against Venezuela during last October’s UPR, when 13 recommendations concerning freedom of expression were presented, all of them were eventually rejected by that government. The official report will be presented on Friday 25 May and the Ecuadorian government will have to accept or reject the recommendations issued today, as well as those that the states present in writing. Fundamedios will attend this session and will provide news coverage through its twitter accounts, @LoFundamental and @Fundamedios, and its Facebook pages Fundamedios and LoFundamental. (Fundamedios/IFEX) – 21 de Mayo de 2012 – Diecisiete estados de América, Europa y Asia realizaron sugerencias para que el gobierno de Ecuador respete y garantice de forma efectiva las libertades de expresión y de prensa en el país. Esas observaciones se realizaron este 21 de mayo de 2012, durante la sesión del Consejo de Derechos Humanos de la ONU, en donde los Estados evaluaron al Ecuador bajo el mecanismo conocido como Examen Periódico Universal (EPU). Alemania, Australia, Austria, Bélgica, Canadá, Costa Rica, Estonia, Estados Unidos, Eslovaquia, Letonia, Luxemburgo, Noruega, Francia, India, Suecia, Suiza, Reino Unido, fueron los países que plantearon observaciones al Estado ecuatoriano para que promueva y respete la libertad de expresión y que elimine leyes que criminalizan la opinión. Algunos de ellos también solicitaron que el Ecuador posibilite de forma real la visita del Relator Especial de Libertad de Expresión de la ONU, para que constate la situación de la libertad de expresión. En este sentido, los países de las delegaciones europeas fueron los más críticos con este tema. Por ejemplo, Suecia mencionó el caso por el que se condenó al exarticulista y directivos de diario El Universo y, pese a que el Presidente desistió de aquel juicio, recomendó al Estado ecuatoriano la protección de la libertad de expresión. Por su parte, Suiza fue enfático en señalar que el Ecuador se vive un clima de censura y autocensura y que el Estado tiene la obligación de respetar este derecho fundamental, mientras que Luxemburgo se mostró preocupado por las intimidaciones a periodistas ecuatorianos. Del lado del continente americano, Estados Unidos fue otro de los Estados más críticos y que mostró su preocupación por los ataques a periodistas y porque en Ecuador no se garantiza plenamente la libertad de expresión. Canadá y Costa Rica también formularon recomendaciones para que se tomen medidas que garanticen la protección de este derecho fundamental, de acuerdo con las normas internacionales. La criminalización de la protesta social y la libre asociación también fueron temas que preocuparon a muchos países como Bélgica, Canadá, Estonia, Francia, Alemania, Hungría, Letonia, Luxemburgo, quienes plantearon sus recomendaciones en el sentido de que deben existir garantías para que los grupos opositores, así como las comunidades puedan protestar libremente, sin ser condenados bajo figuras como el terrorismo y sabotaje. Al respecto España recomendó revisar la legislación restrictiva para ONG y criminalización de la protesta social en el país. Frente a estas inquietudes, la delegación ecuatoriana, encabezada por el vicepresidente Lenin Moreno; el canciller Ricardo Patiño, la ministra de Justicia Johana Pesántez y el secretario nacional de comunicación Fernando Alvarado, aseguraron que en el país no se censura ni se persigue a la prensa y que tampoco existen periodistas encarcelados. “En Ecuador se respeta absoluta y totalmente la libertad de expresión”, mencionó el canciller Patiño. Las 17 observaciones formuladas superan a las realizadas a Venezuela, en el EPU de octubre pasado, en dónde se plantearon 13 recomendaciones sobre libertad de expresión, todas las cuales fueron rechazadas por dicho Gobierno. El próximo viernes 25 de mayo, se presentará el informe y el Gobierno ecuatoriano aceptará o rechazará las recomendaciones realizadas hoy, o aquellas que los estados presenten por escrito. Fundamedios estará presente en esta sesión y acompañará la cobertura noticiosa a través de sus cuentas de twitter, @LoFundamental y @Fundamedios y sus páginas de Facebook, Fundamedios y LoFundamental. UPDATED: The Government of Slovakia cooperates with the UN offices in Vienna to show Sustainable Development inspired films and exhibits – May 14-18, 2012. 99% Rust – Director: Nenko Genov (Bulgaria, 2010, 4 min) About 70% of all metal is used just once and then it is discarded. Tomatoes Eat You! Director: Nenko Genov (Bulgaria, 2010, 1 min) For generations they were cooked, mashed, canned, eaten alive… or even worse! And now they strike back! Prepare for a horror beyond your imagination! This summer tomatoes eat you! Africa: Digital Graveyard: A UNTV film. Director: Mary Ferreira (2011, 10 min) Mobile phones and computers have transformed the lives of many – yet billions of discarded electronic devices are ending up in landfills in the world’s poorest countries, posing a potentially lethal toxic threat. But one African country is finding innovative ways to handle this so called e-waste. We posted the UN in Vienna activity originally on May 8-th and the UPDATE is after the first day of the Vienna showings – May 14-th. We learned from Dr. iur Hana Kovacova, Deputy Permanent Representative of the Slovak Republic to the International Organizations in Vienna, that Ekotopfilm is a Slovak organization based in Bratislva that holds yearly film and documentary showings on topics of Sustainable Development and the environment. This year the show and judging of the films will take place in Bratislava in October in a five days film festival. This will be followed by a 3-4 days event in November in Kosice where the films will get a commercial preview. The May event in Vienna is to honor both – the preparations for RIO+20 and the colleagues at the UN Headquarters in Vienna. Ekotopfilm, based in Slovakia, awarded the top prize to a film, “Africa: Digital Graveyard”, produced by me for my employer, United Nations Television, UNTV – said Mary Ferreira, who made this film . The film is part of UNTV’s monthly series 21st Century and won first place out of 20 contenders in the Current Affairs category. Now, why should one send what is considered garbage in Developed countries, to lesser developed countries – even under guise of extracting value from them -? Will this allow for a modicum of self-esteem. The 15 May 2012, 12:00 Film screening: Trou de Fer – The Iron Hole UNIS Cinema Room G0575. Director: Pavol Barabas (Slovakia, 2011, 55 min) Trou de Fer is a unique and majestic natural phenomenon sitting in the heart of the National Park on Reunion Island. Volcanic eruptions made the Earth sink into a void and continuous and heavy rain showers formed a place like no other. Because of its inaccessibility nature has been left untouched and untamed. The depths of the canyon have been visited only by a few individuals. Director: Jean Bourbonnais (France, 2009, 52 min) The trash we generate, our outmoded or broken gadgets, the water we waste – it is all thrown out into the environment after we have used it. Far from being satisfied with managing the accumulation of electronic waste, most of which contain toxic materials that are harmful to the environment and human health, Fernando Nilo also wanted Recylca to provide jobs for socially disadvantaged people. This film shows how bad our relation is to the environment and to ourselves. How the throw-away society is losing its treasures and making the land inhabitable by throwing away as pollution resources we could use as further inputs to industry. Water is a recurrent topic – we use it and rather then clean it up and reuse it, we throw it into the pool of man-made pollution. The other recurrent topic is electronics waste that literally harbors gold. The target of the film is us and it tries to tell s that we will gain even financially by doing the right think of harvesting the present polluting waste. The film week will be accompanied by an exhibition on EKOTOPFILM International Festival of Sustainable Development Films. The exhibition will also present finalists of the Drop by Drop – the Future We Want Ad Competition, launched by the UN Regional Information Centre in Brussels (UNRIC), in collaboration with the UN Environment Programme and UN information offices in Europe with the support of the Nordic Council of Ministers. In the competition Europeans were asked to create a newspaper ad that inspires others to preserve water now and for future generations. A system was in place at the time but the UN in Vienna does not want us to continue providing that information. The Present State of Hungarian Democracy: The word Republic was dropped and the name of the country is “Magyarorszag”, that is LAND OF THE HUNGARIANS which spills well over the borders of Hungary towards the Adriatic and the Black Sea. Zum Zustand der ungarischen Demokratie.- Ungarische Sackgassensozialisten. Gegeben der Fall, dass eine Partei eine 2/3-Mehrheit im Parlament besitzt – ohne Koalition versteht sich. Ebenso gegeben, dass das auch der Präsident ein Abkömmling dieser Partei ist. Wie setzt man sich der Willkür einer solchen Regierung entgegen? Bis vor ein paar Jahren kämpfte sich die sozialistische ungarische Regierung durch verschiedene Krisen. Machtlos, aber ehrlich. Ein parteiinterner Sager des inzwischen ehemaligen Premiers Ferenc Gyurcsány, die Regierung hätte “die letzten eineinhalb, zwei Jahre durchgelogen” erreichte jedoch die Öffentlichkeit und seine Ehrlichkeit, die Genossen zu ebensolcher anzuhalten belohnte der Wähler nicht. Ein Erdrutschsieg für die konservativ-nationalistischen Jungdemokraten (Fidesz) folgte. Damit ein glattes KO für alle anderen Parteien. Die Sozialisten wurden auf 15% – man könnte sagen „geprügelt“, die rechtsextreme Jobbik-Partei, auf 10%. Die Jungdemokraten hätten eigentlich eine sehr ehrenhafte Geschichte zu verzeichnen: In den letzten Jahren des Kommunismus gegründet, waren sie eine der Kräfte, die Ungarn in die westliche Welt und in die Demokratie führten. Gegen diese neuen Segen soll die Bevölkerung nicht demonstrieren. Schon gar nicht vor dem Parlament. Deswegen steht eine Fotoausstellung am Kossuth-Lajos-Tér. Inmitten der Bilder von ehemaligen großungarischen Gebieten kann man weder Versammlungen noch sonstige größere Projekte abhalten. Zu sehen sind ungarische Holzfäller in Rumänien, ungarische Volksfeste in Rumänien und „richtige“ Ungarn – seltsamerweise ebenfalls in Rumänen. Ungarn von der Adria fast bis zum schwarzen Meer suggerieren diese Tafeln – eine Ablenkung. Die Menschen in der Republik Un… Verzeihung. In „Ungarn Land“, wie es nach der neuesten Verfassungsänderung heißen soll protestieren inzwischen auf der Straße. Gegen die neue Mediengesellschaft, die unliebsame Berichte einfach wegzensieren kann, gegen Arbeitszeitverlängerungen der Feuerwehr (will sich der geneigte Leser von einem 62-jährigen Feuerwehrmann retten lassen?) oder einfach gegen die komplett unfähige Regierung. Man wird standhaft bleiben und die Gesetze respektieren. Spätestens 2014 muss Premier Orbán seine Rechnung begleichen! Resignierend gesteht er ein, dass es keine anderen Optionen gibt. Im Magyarenland gibt es keinen Volksentscheid – und möglicherweise auch bald keine Demokratie mehr. Wo ich das jetzt lese – gerne hätte ich in den Artikel noch eingefügt, dass Richter ab sofort mit 62 zwangspensioniert werden. Jüngere Richter sind leichter zu beeinflussen. Political fall-out from the Japanese nuclear power crisis enhances Green power in Germany and will impact all Europe. In the key state of Baden-Wuerttemberg the anti-nuclear Green party more than doubled their vote to 24.2 percent, allowing them to capture the state’s presidency when combined with Social Democrat allies who garnered 23.1 percent. CDU’s share of the vote slumped from 44.2 percent in the 2006 state election to 39 percent, according to official figures. The Christian Democrats have held power in the state for almost six decades. The outgoing governor, Stefan Mappus, was a strong advocate of nuclear energy. “This is a day that has strongly changed the political landscape in Germany,” Green party chairwoman Claudia Roth said in Berlin. The outcome of Sunday’s (27 March) election is seen as an important setback for Merkel, whose attempts to stop political contamination from Japan’s nuclear accident appear to have failed. Directly after news of damage to Japan’s Fukushima nuclear reactor emerged, the chancellor temporarily suspended production at seven of Germany’s oldest reactors among its 17 nuclear plants. The move was seen by a generally nuclear-sceptic public as electioneering. The switch just did not help and brought about deep mistrust. Sunday’s vote in the wealthy south-western state of 11 million people followed demonstrations in various German cities over the weekend, with roughly 200,000 people calling for the permanent closure of all reactors at the country’s 17 nuclear plants. Germany’s Green party also did well in concurrent elections in the Rhineland-Palatinate state, where the ruling Social Democrats will now need them as coalition partners. The country’s Liberal party (FDP) led by foreign minister Guido Westerwelle, CDU coalition partners, were the seen as the weekend’s big losers in both polls. EU leaders on Friday agreed to stress test the bloc’s 140-plus nuclear plants, but despite moves in Germany many countries including France and the Czech Republic have shown little appetite for a reduction in their nuclear energy use. French President Nicolas Sarkozy’s centre-right UMP party also suffered considerable losses during the second round of French local elections over the weekend, the last direct voting before presidential elections next May. Opposition Socialists emerged as the main winners of the local elections, securing roughly 35 percent of the vote. In Austria, Kanzler Faymann of the Austrian Socialist Party (the SPÖ) is expressing his happiness with this week-end’s election results. After all, just last week it turned out that the Former Kanzler Mr. Schuessel is on a yearly retainer of 200.00 EURO from the German biggest nuclear company RWE. – this while the Austrian Environment Minister Niki Berlakovich proposed stress tests for all EU nuclear plants. How will Mr. Schuessel react if an RWE reactor fails the Berlakovich stress test? But we do not stop at this as we must remark that Austria draws electricity from the Verbund network that includes nuclear plants outside Austria. To us this means that despite the positioneering – Austria is not really nuclear free. Will there be now young people in Vienna, like those in Germany, to protest publicly against all EU nuclear plants? Will other politicians in the EU learn from the debacle that has befallen Ms. Angela Merkel, the German Kanzler? It seems that the pro-nuclear stand she had just two months ago may now lead to her political demise, and Germany is watching how a chemistry teacher, Winfried Kretschmann, replaces the pro-nuclear Prime Minister Stefan Mappus of that 11 million people State of Baden-Württemberg where the right of center CDU was in power for 58 years. The Japan disaster has brought so far the Green Party for the first time in German history to head a Prime Minister’s cabinet, and they will be in the rulling coalition in two German States – also in the industrial State of Rheinland-Pfalz. The lack of trust in the honesty of their leaders, as evidenced in nuclear policy issues, will probably lead to similar results in future elections. 3/11 has the potential of becoming a date to remember as 9/11 is. Then we learned to live with terrorism, now we may have to start to learn to live without nuclear power – or without the security we felt from believing in a life based on unsustainable energy – call it the assumed right to waste energy. From Hiroshima 1945 to Fukushima 2011 – it is “Cukooshima!” Professor Max Thuerkauf remembered in a note to HEUTE by Cardinal Christoph Scoenborn. Let me start by saying that this posting is not an expression of any arrow shooting at Japanese that acted for all those years against their best interests. Yes – but sorry – it was Cukoo. It all started with Japan believing it can stop US expansion in East Asia, and Japan picking the losing side in WWII. This led to the dropping of two nuclear bombs over Japan. Then Japan decided to compete with the US economy and went the way of nuclear energy for peaceful use. Now we see that this was as disastrous as their first encounter with nuclear technology – but this time by their own choice. We love Japan. For one – I spent three weeks in Kyoto in 1997 with the UN Framework Convention on Climate Change meeting that gave birth to the failed Kyoto Protocol. At that time I got to know the Kyoto – Nara – Osaka triangle. But this was not my only encounter with the Japanese. In effect, with my family, we spent two weeks staying with Japanese in their homes thanks to the Ryokan hospitality system, and we exchanged our time-share at the Krystal Vallarta, Puerto Vallarta, Mexico, for a week at the Resorpia Hakone Japanese Business Class Resort at Hakone, at the foot of the Fiji Mountain. We got to know two different levels which sandwich the Japanese society. With this said – let me add that I write now from Vienna and that the Austrian people have voted down the opening of an atomic plant as they understood the terrible danger of living with an atomic monster-plant in your backyard. Austria has not even one nuclear plant but gets part of its electricity from the European grid that includes nuclear plants. The Austrians are thus not clean of nuclear energy either – this unless they disengage from the European grid and run their own separate grid for which they have enough hydro-power to provide over 80% of electricity need and could easily supply the remaining part with biomass, biofuels, solar and wind energy. Clearly no real need for nuclear power and the possibility to achieve this without empty posturing based on the truth that once in the past they voted down the opening of the Zwentendorf nuclear plant. Zwentendorf, a Nuclear Plant That Will Never Be Turned on. also ready to go and hotly contested. as Zwentendorf have been shut down permanently by mechanical problems. protected from contamination in case of a meltdown. then he fell from power. The Ayatullah wasn’t interested. pro-Zwentendorf anti-Kreisky people to vote no. Zwentendorf. The Austrian nuclear power program came to a halt. Austrians understand the pain of Japan and the papers are full with articles and letters regarding the nuclear events unfolding in Japan. H. Fruhwirth from Hoenbach reminds us that it is Austrian Environment Minister Nikolas Berlakovich who suggested the stress-tests for all EU AKWs and thinks that had one done so with the Fukushima plants perhaps they would have been stopped before disaster stroke. The mentioned stress tests have already led Germany to announce the non renewal of the operating licenses for as many as 12 plants – this to take effect in a month or two. Further, the letter points out that politicians, and those that favor nuclear power, finally were driven by what happened in Japan to the realization that humanity is helpless before environmental inputs. S. Hauer writes a short note asking why the EU deals with crooked bananas and crooked cucumbers, but has no decisions regarding the AKWs, airplane accidents, acts of terror, earth-quakes – even though it is clear that 100% safety does not exist? On the following page there is an article titled ANSWERS, by Vienna Cardinal Christoph Schoenborn. The Cardinal announces that tonight, Friday March 18th, 7 pm, he will hold at the Stephansdom (clearly most important Cathedral in Austria) – a special service for Japan. The Cardinal writes that the Fukushima events made him think these last days of his friend, a Chemist at the University of Bern, Switzerland, Professor Max Thuerkauf, who lost his position at the university because of his criticism of the technological insufficiencies of our times and warned of dangers even of the peaceful uses of nuclear power. His words sound prophetic these days. Back in 1984 he was saying that the nuclear power plants were just the tip of an iceberg – the development of technologies that were unsustainable. No engine is safe he was saying to those that argued that nuclear power plants are safe. He was noting that men build them, and use them, and we know that even the impossible can happen. Thuerkauf said that atomic energy is a fire that cannot be extinguished – surely not by closing a faucet. There is no material that can extinguish a fire that burns a thousand time brighter then the sun – the artificially created radioactivity. Science has no means to bottle up this artificially created radioactivity will be here for eternity, and the Cardinal calls us to reconsider what we are doing and look at what price the poor Japanese will pay for these activities. But I cannot leave it at this only. I feel I must make a further comment regarding the Japanese culture that bred the reality of people committing harakiri for some National purpose. Obviously, we had no admiration for those that sacrificed themselves for their emperor and we do not admire a Prime Minister who makes now an official visit to the shrine that sort off deifies their memory, but look now at the 50 workers that still busy themselves in the pit left by the explosions at the dying reactors of Fukushima. These people know they have little chance to survive. The head of the Japanese nuclear authority did not go to inspect the disaster – right on location. He must have had years ofd good pay and it is those workers that will be his sacrificial lambs. He is no better then the US bank-directors that raked in the profits from the financial collapse in the US or the BP officials who watched the fouling up of the US Gulf. Neigh – the Japanese energy leaders might actually prove to be much worse then these other self-gratifiers. The cloud of nuclear mistrust is based on decades of industry and governments statements. Will the public rebel? A cloud of nuclear mistrust spreads around the world. It is unprecedented: four atomic reactors in dire trouble at once, three threatening meltdown from overheating, and a fourth hit by a fire in its storage pond for radioactive spent fuel. All day yesterday, dire reports continued to circulate about the Fukushima Daiichi nuclear plant, faced with disaster after Japan’s tsunami knocked out its cooling systems. Some turned out to be false: for example, a rumour, disseminated by text message, that radiation from the plant had been spreading across Asia. Others were true: that radiation at about 20 times normal levels had been detected in Tokyo; that Chinese airlines had cancelled flights to the Japanese capital; that Austria had moved it embassy from Tokyo to Osaka; that a 24-hour general store in Tokyo’s Roppongi district had sold out of radios, torches, candles and sleeping bags. But perhaps the most alarming thing was that although Naoto Kan, Japan’s Prime Minister, once again appealed for calm, there are many – in Japan and beyond – who are no longer prepared to be reassured. And first palpable direct result – see Germany closes seven of its oldest reactors. Christina Patterson: What do we do with tragedy like the one in Japan? Under the Patronage of the President of the Republic of Austria – Dr. Heinz Fischer – A Muslim Jewish Conference of students from Austria, Israel, Lebanon, Pakistan, Saudi Arabia, Switzerland, Turkey and the US – August 1-6, 2010 – talk about Antisemitism, Islamophobia, and the toning down of hatred in the media. Under the Patronage of the President of the Republic of Austria – Dr. Heinz Fischer. With a Honorary Committe that includes Patricia Kahane – President of the Karl Kahane Foundation, Dr. Michael Hauple – Mayor of Vienna, as well as Former Vice Chancellor and Foreign Minister – Dr. Alois Mock, and famous Austrian artists – Andre Heller and Joseph Hader. Also among others, Rabbi Marc Schneier from the US, Rafi Elul from Israel, Ibrahim Issa from Palestine. The Conference will deal with Anti-Semitism, Islamophobia, and the toning down of media that inflames hatred. The Conference will avoid touching upon Middle East Conflict Issues in an effort at reaching first mutual understanding before tackling issues on which there can be built an agreement to disagree – and seeing that there are other points of view. THE MUSLIM JEWISH CONFERENCE – VIENNA – AUGUST 1-6, 2010. «Our first step together creating the power to forge a link between possibility and reality. aspiring Jewish and Muslim academics. Today, the ‘MJC’-committee harbours over 20 volunteers from Asia, the Middle East, Europe and America, including countries like Austria, Israel, Lebanon, Pakistan, Saudi Arabia, Switzerland, Turkey and the U S. The Assistant Secretary General in charge of the core of 15 volunteers is Ehab Bilal who grew up in Austria, studied in the UK, and is a Muslim of Libyan parentage. The ‘Muslim Jewish Conference’ is officially endorsed by the ‘United Nations Alliance of Civilisations’ (UNAOC) and the Austrian Ministry of Foreign Affairs. The project is partly financed by the ‘Karl Kahane Foundation’ as well as by private donors. The participants represent a new generation of thinkers and upcoming opinion leaders who are connected by their joint believe in a new era of cooperation. When we researched the internet, we found that The Muttahidda Jihad Council (MJC), an alliance of Muslim Kashmiri freedom fighters as they call themselves, or terrorists, as we call them, is what the web knew as MJC before the start of this new Austrian effort. Things get even worse as there are other Abdul Niazi on the web. Whatever, we hope that the Austrian effort grows to become a success and we remember the role Chancellor Kreisky had in starting Israeli-Palestinian negotiations years ago. Further, Karl Kahane and Bruno Kreisky , with other Kreisky friends, created in 1991 through the Karl Kahane Foundation also the Bruno Kreisky Forum in order to continue the Kreisky’s work on Human Rights, the Middle Eastern Peace Process, Europe after the Cold War, and other issues close to him – we assume that the powerful ongoing Kreisky Forum had something to do with the organization of this new effort at tackling the Middle East peace process issue from a longer term understanding base. The involvement of Rabbi Marc Schneier from the US is proof that his three year old ongoing effort, on which our website reported several times, of bringing Jewish and Muslim communities in the US to a closer contact with meetings in homes as well as within religious centers, intended to listen to each others deep concerns rather then professing to shout at each other their frustrations, is part of the concept of the new effort. Also, New Generations – Crossing Borders. In 1994 the Middle East Youth Peace Forum together with the Bruno Kreisky Forum for International Dialogue started the project New Generations – Crossing Borders. A group of young Palestinians, Israelis, Jordanians and Austrians met regularly over a period of four years in order to establish personal relations, overcome stereotypes, gain skills in conflict resolution and acquire leadership qualities. The experiences of the participants were documented in the German/English publication Crossing Borders by Margit Schmidt et al, published by Picus Verlag, Vienna, 1999. This comes to show that the young may eventually achieve what the older generation was not able to achieve. Muslim Jewish Conference von 1. bis 6. August in Wien. Wien. 60 muslimische und jüdische Studierende aus aller Welt treffen von 1. bis 6. August in der Uni Wien bei der “Muslim Jewish Conference” (MJC) zusammen. Das Ziel: eine gemeinsame Sprache zu finden und Vorurteile zu überwinden, sagt MJC-Generalsekretär Ilja Sichrovsky. Der 27-Jährige studiert in Wien “Internationale Entwicklung”. Sichrovsky hat mehrmals an der “World Model United Nations Conference” teilgenommen, bei der eine Uni-Delegation ein Land verkörpert. Dabei ist der Wiener Jude mit muslimischen Studenten in Kontakt gekommen und musste feststellen, dass die Vorurteile auf beiden Seiten groß sind, man aber vieles im intensiven Gespräch ausräumen kann. “Ich habe gemerkt: Wir sind gar nicht so verschieden, wie es uns Medien und auch unsere Eltern zu vermitteln versucht haben.” So kam ihm 2008 erstmals die Idee für die Konferenz. Organisator ist Ehab Bilal (25). Der bekennende, aber nicht streng praktizierende Moslem kommt aus einer libyschen Familie, wuchs in Wien auf und studierte in England. Seit 9/11 hat er das Gefühl, “dass ich schon ein bisschen unterdrückt werde wegen meiner Religion”. Wenn er reise, werde er drei Mal gefragt, mit welchem Ziel er komme. Ihn ärgert, dass wegen einiger Extremisten die gesamte Religion in Verruf kommt. “Antisemitismus und Islamophobie” – Sichrovsky betont, dass es sich um eine Aufzählung, nicht um eine Gleichstellung beider Begriffe handelt – sowie die Rolle der Bildung und der Medien im Abbau von gegenseitigen Stereotypen. Der Nahostkonflikt wird beim ersten Mal bewusst ausgeklammert. Man müsse zuerst eine gemeinsame Sprache finden, bevor man ein Thema angehe, “wo man weiß, dass man anderer Meinung ist”, so Sichrovsky. Die Konferenz wird großteils von der Karl Kahane Foundation finanziert, Bundespräsident Heinz Fischer übernahm den Ehrenschutz. 120 Studenten hatten sich beworben, die besten wurden ausgewählt. Ihr Spektrum reicht von sehr religiös bis säkular. The International Press Coming in September to Vienna and Bratislava will discuss the future of Journalism and it is hoped will realize that while it blooms in countries like India it grows by leaps all over via the internet. Those trying to hold back – will lose out. WORLD CONGRESS – 2010 VIENNA & BRATISLAVA – September 11-14, 2010. Jeff Howe, Coiner of the Term ‘Crowdsourcing’, Tells IPI Why Journalists Need To Face up To Change. If history has taught us anything, it has taught us that things change. Ideas that were once innovative become commonplace, taken for granted and eventually obsolete. Industries emerge, grow and are ultimately forced to adapt or collapse. If we have seen such change in so many other industries – mining, car-making, banking –should we be surprised to see it happening in the news industry? Nonetheless, news organisations are still grappling with the change thrust upon them by the Internet. Many news outlets are finding themselves forced to make cut-backs to their professional staff. According to the Pew Project for Excellence in Journalism’s annual review of the America media landscape, 5,900 journalists lost their jobs in 2008 alone, more than double the number of 2,400 in 2007. As news organisations struggle to maintain their position in the industry, executives have turned to much cheaper – or even free – means of creating content. ‘Crowdsourcing’ – a term coined by Howe in an article for Wired magazine in 2006 – is just one of the latest buzzwords/innovations which media owners hope will provide them with some respite from what some see as an inevitable decline. Howe’s term – which was invented to cover a whole host of businesses, and not just the news industry – has since taken on a life of its own, covering a multitude of free, collaborative efforts. Speaking to the International Press Institute (IPI) ahead of his appearance on the panel “Found News? The New Platforms for Delivering Information” at the IPI World Congress in September, Howe stated that in journalism crowdsourcing has two different meanings: ‘reverse-publishing’ or ‘document-dumping’. Reverse-publishing has been adopted across the media landscape at many different levels; from hyper-local projects such as Glasgow’s Evening Times mini-sites in Scotland, UK, where locals write their stories which if good enough are then published in the daily newspaper, to the likes of CNN’s iReport, where, once verified by a CNN editor, viewers’ own video footage and photographs can be broadcast on the international news channel. Document-dumping, which is probably closer to Howe’s original notion, has become increasingly common as staff numbers have dwindled at news organisations. For many newspapers, gone are the days when staff could be allocated enough time to pore over pages and pages of documents for an investigative report. And in the era of the World Wide Web, why bother, when you can get a team of interested readers to do the work for you? An example of document-dumping came last summer when, in the wake of the expenses scandal at the Houses of Parliament, the UK-based newspaper The Guardian uploaded 458,832 pages of documents to its website and invited its readers to “join us in digging through the documents of MPs’ expenses to identify individual claims, or documents that you think merit further investigation.” The “best” individual discoveries were then collated online, enabling the Guardian’s own journalists to follow up and write thorough analyses for the newspaper and its website. The project is so large that, although it was launched in June 2009, less than half of the documents have been reviewed online so far. But are all these crowdsourcing efforts devaluing professional journalism? Although he holds a positive outlook for the future of journalism, Howe agrees. “Professional journalism is being devalued whether we like it or not,” he told IPI. “In fact, it’s not as much being devalued as it is being ‘amatuerised’. However, despite the growing presumption that anyone can write a news story, Howe remains passionate about journalism, and believes there will still be a place for good, solid reporting. Among the most radical of Howe’s views is the belief that in the not so distant future, the term ‘journalist’ may have ceased to exist. “To tell you the truth, and I know it’ll sound pretty radical to a bunch of journalists, but I think we do ourselves a disservice by calling ourselves ‘journalists’,” he said. Perhaps he’s right. If the root of the conventions stays the same, perhaps the term by which we refer to those who adhere to those conventions will change. After all, the term ‘journalism’ only dates back to the 1800s, but newspapers have existed in some format for over 1000 years, with the bulletins in Roman times and 7th century China. Even the term ‘newspaper’ only dates back to the 1600s. Who knows what we will be calling ourselves in 25, 50, 100 or 500 years? But in the shorter term, as the editors, publishers and leading journalists of today gather in Vienna in September for the IPI World Congress, to debate whether we are losing the news, Howe is hoping for one thing: “Knowledge transfer. One thing alone, it would be great to get Americans to realize that newspapers are flourishing in countries like India! Jeff Howe is a contributing editor at Wired Magazine, where he covers the media and entertainment industry, among other subjects. In 2006, he published “The Rise of Crowdsourcing” in Wired. He is also a Nieman Fellow at Harvard University and teaches a course entitled “The Independent Journalist in the Digital Age”. Howe will appear on the “Found News? The New Platforms for Delivering Information” panel in September alongside Hannes Ametsreiter, CEO of Telekom Austria Group, Josh Cohen, Senior Business Product Manager at Google News and Rajesh Kalra, Chief Editor at Times Internet Ltd in India. The panel will be moderated by Errol Barnett, presenter of CNN’s iReport. This is change if the old media likes it or not. In the end the computers win over the typewriters – we bet!